Flat Earth; An Investigation Into a Massive 500-year Lie, will be out in 2-3 weeks. Email me @ jwlpeace@gmail.com for first copy, discounted, signed if you want copy. I’ll notify you when books are ready to ship for mailing addresses. On Aug. 21, the moon will completely blot out the sun for observers in 12 states, from Oregon to South Carolina, in the first total solar eclipse visible from the United States mainland since 1979. Another assumption and supposed proof of Earth’s shape are the solar and lunar eclipses that occur periodically overhead. A lunar eclipse is said to occur when the Earth passes between the Moon and the Sun, and the Earth’s shadow obscures the moon or a portion of it. A solar eclipse occurs when the Moon passes between the Earth and the Sun, blocking all or a portion of the Sun. An eclipse can be total, partial, or annular. All three must be in near perfect alignment for one object to be blocking full view from another. Yet, how can this be when we are down here on Earth and the Moon is said to be hundreds of thousands “up” in space and the Sun tens of millions of miles? For the Sun’s light to be casting Earth’s shadow onto the Moon, the three bodies must be aligned in a straight 180-degree syzygy, but as early as the time of Pliny, there are records of lunar eclipses happening while both the Sun and Moon are visible in the sky! 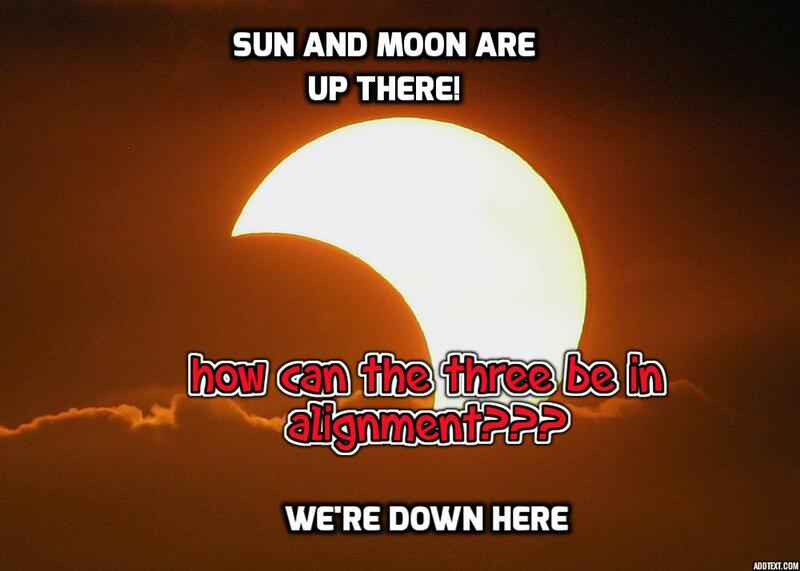 Therefore, the eclipsor of the Moon cannot be the Earth/Earth’s shadow and some other explanation must be sought since Earth is “below” the Sun and Moon above. In order for modern heliocentric theoretical astronomy to validate eclipses they had to make the Sun 400x larger than the moon and exactly 400X farther away from Earth so it all would fit perfectly into their model. Flat Earth models relate the Suns electric energy, to the Moons receptive magnet attraction. The Moon is its own luminosity and is said by ancient cosmology to have its companion Moon, Black Rahu, who passes in front of the Moon to cause the Moon phases. Since the Sun and Moon are roughly the same size in a FE model, it is easy to understand how a dark brown, or binary star of equal size, could occult the Moon, which ancients called the Black Rahu. It should also be noted that ancient Chinese astronomers were able to predict eclipses as far back as 2500 BC without aid of modern day telescopes, instruments or the Nazi’s and Freemasons who created NASA. Moon Reflecting Sunlight onto Earth Theory Is an Absurdity!